Under 11 Lionsarrow-rightCreated with Sketch. Man of the Match Aarav Tanguturi produced an awesome spell of bowling and picked up an incredible 4 wickets in 4 balls. He followed this up with a good contribution with the bat – 16 runs with lots of well judged quick singles. Reading fielded a relatively inexperienced team with several boys playing a hard ball cricket match for the first time. Reading won the toss and elected to bowl. Thatcham made a strong start with their opening pair scoring 39 runs with no wickets lost in their 4 overs of this pairs match. Ex Reading player Oliver Ireland played particularly well hitting 7 fours in an unbeaten 34. Despite this tough start Reading stuck to their tasks in the field, working very hard on backing up. It was also great to see lots of encouragement for the new players and a good all round team spirit. Matthew Allen bowled well on his Reading debut and was rewarded in his second over knocking over the Thatcham player’s stumps to earn Reading’s first wicket. Aarav then earned his first 2 wickets at the end of his 2nd over – one caught and bowled, one bowled. He was ably supported on his Reading debut by Ajmal who bowled 2 good overs of leg-spin and was rewarded in his second over when he had the Thatcham batsman caught and bowled. 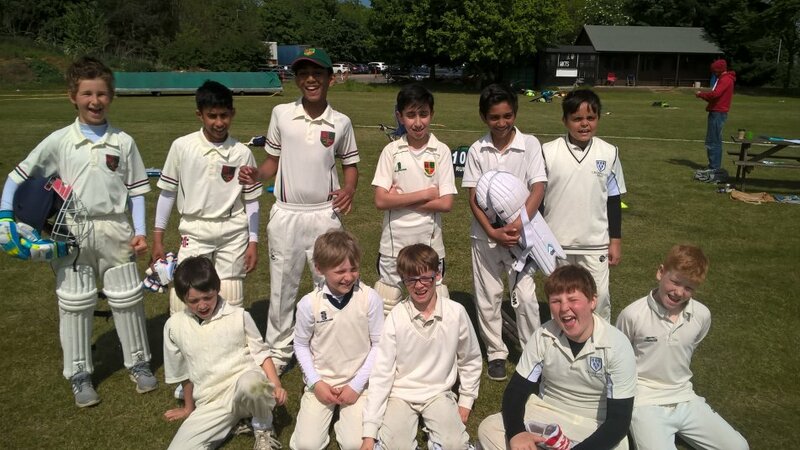 Further wickets were claimed by Zac and Josh, before the heroics of Aarav who completed his hat-trick with the first ball of his final over, before incredibly getting his 4th wicket next ball before being mobbed by his jubilant team mates. Sam gained the 10th wicket in the final over of the Thatcham innings. This represented a good fight-back by Reading. At the end of the 22nd over of this pairs match Thatcham had been on a commanding 312 but by the end of the 24 over innings they had been pegged back to 300. Ajmal impressed on his Reading debut hitting 2 huge sixes. He was partnered by Jibran playing in a hard ball match for the first time, who hit a 4. Nathan batted well, hitting a couple of 4s as well as running well between the wickets with his partner Ashman to score a well played 13. Aarav backed up his bowling with some confident batting – well timed strokes and quick singles scoring 16 runs (out once for a net score of 11). He was well supported by his partner Matthew. Effective bowling and fielding by a good Thatcham side pegged back Reading, and despite the best efforts of final pair Henry and Zac, Reading were unable to reach the Thatcham total. Reading scored 125 runs, with 11 wickets falling to give a pairs cricket score of 275 – 25 short. Special mentions needs to go to Zain who is very new to cricket, but noticeably improved his bowling and batting as the match progressed. Also to Jibran and Ashman who are also new players who bowled economical spells. There was a really good spirit amongst the boys, with everyone working hard to contribute. Well done on a good performance.